A very entertaining nativity musical, 'Jesus' Christmas Party' is based on million-selling storybook by Nicholas Allan, and it has huge child-appeal. The show is lively, funny and very easy to direct, with songs that almost teach themselves! Two versions of the script are included - one for age 5 to 7, the other for age 7 to 10. The innkeeper and his wife settle down to sleep after a hectic day, but a stream of visitors keep showing up, asking for Mary and Joseph. 'Round the back!' the innkeeper shouts, grumpily! Eventually, desperate for sleep, he flies into a rage and goes to see what all the fuss is about: it sounds like some kind of party out in the stable! But as soon as he sees newborn baby Jesus, the innkeeper softens and joins in the celebration. Click on the Video tab below for some animated fun! 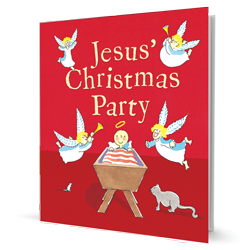 ''Jesus' Christmas Party' is fantastic - easily the best infant production we've ever done. The children were very motivated by the wonderful songs, which we'll definitely be using again, especially 'Shine Away'. 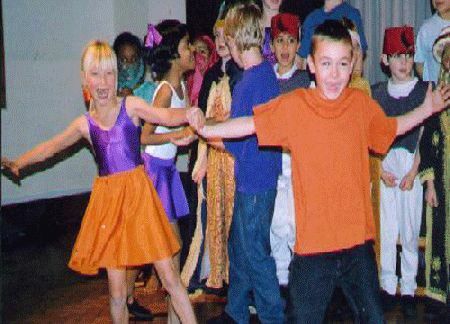 Everyone thoroughly enjoyed the show.' ~ T Clarke, Deputy Headteacher, Cornwall. Review by Wendy Churchill - Teacher, Blackheath. Thanks very much! 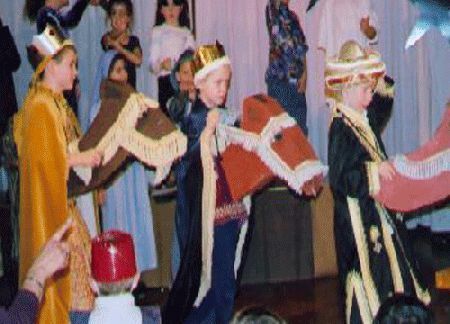 I am producing Jesus' Christmas Party with my Year 2 kids at school and we are really enjoying it! I particularly love your backing tracks. 'Jesus' Christmas Party' is fantastic - easily the best infant production we've ever done. The children were very motivated by the wonderful songs, which we'll definitely be using again, especially 'Shine Away'. Everyone thoroughly enjoyed the show. Review by Pauline Martin - Head Teacher, Leicestershire. This is just to say a big thank you for 'Jesus' Christmas Party' which we performed as our Christmas concert this year. We all loved it and have been receiving many compliments. The script, music and ideas were excellent. 'Shine Away' had us all in tears! The show was a great success! Everyone, from the children who performed, through to the parents, teachers and other pupils who made up the audiences, really enjoyed all the songs and the great script! (even though some of these Scottish children are now singing with an English accent!) Thanks for a great show. This is a great musical for children! It has infectious melodies, great lyrics and a script that is simple and funny. This was a fun show to put together for the teacher as well as the students! 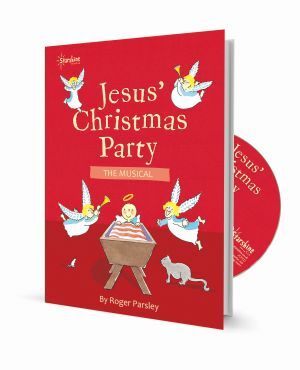 Thanks, Starshine Music - Jesus' Christmas Party was our best ever production! Excellent music - we all loved the variety. This is a wonderful show, the songs are beautiful. Simple, funny and conveys the message of Christmas really well. If you liked the book, you'll love the play! 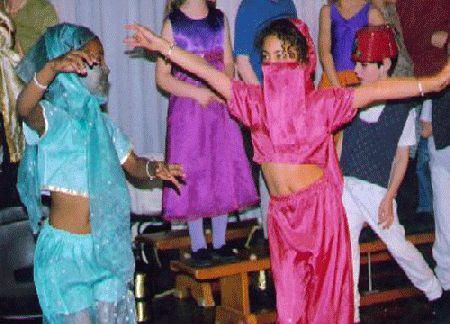 This play captured the interest of the children immediately. I love the simplicity and the humour of the play. The music is great. It's lively, and to have the backing tracks makes the music sound professional. 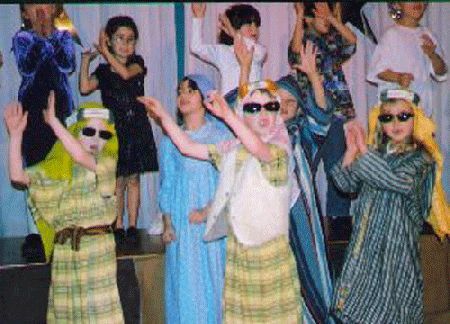 We performed the musical and it was a huge hit. It was funny, everyone loved it, and it will now be part of our regular rotation. Lively, Upbeat And Easy To Direct. The show is lively, upbeat and easy to direct. The children really enjoyed the songs and the backing arrangements are very good. An enjoyable experience all round! Children Rose To The Occasion. I was a little nervous when asked to head up the production of this play, not having been in sole charge of such a production before. However, over 100 children of many different nationalities (American (mostly Chinese American), Singaporean, Malaysian, Hong Kong nationals, French, Canadian, etc), participated and the play went really well. The music was sufficiently 'catchy' and so easy to learn that we managed to do it during regular Sunday meetings. The children rose to the occasion. The Sunday school had not previously done a presentation like this, and we got a lot of very good comments afterwards, both from children who enjoyed doing it and from parents and others who enjoyed watching. One of the kings asked, as she went off stage at the end, "Can we do it again next year?" - so watch this space!